Key Difference: Tolerance means to be able to allow and accept the existence of something that differs from your own beliefs or opinions. Most commonly the term is used in the context of religious or political beliefs. Intolerance is when people cannot accept views, beliefs, or behavior that differ from their own. The terms tolerance and intolerance are often used by people, especially by politicians and leaders when making speeches or appear to be making a point. However, it often seems like they don’t really know the meaning of the word or that they use it ambiguously to deliberately confuse people. Let’s look at what the terms actually mean at their core without all the political agenda clouding them. 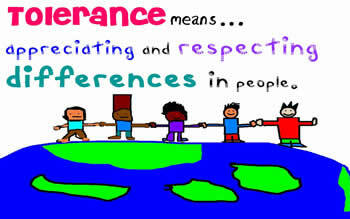 The terms tolerance and intolerance are antonyms, which basically means that they are opposites of each other. So, in order to understand what intolerance means, let’s look at tolerance first. Tolerance has a twofold meaning, one is the political one, and the other is medical. However, the root of the meanings is the same, which is to accept. Tolerance means to be able to allow and accept the existence of something that differs from your own beliefs or opinions. Most commonly the term is used in the context of religious or political beliefs, where most people are not able to accept the fact that some people tend to have different opinions or beliefs that their own; this is called intolerance. Intolerance is basically when people cannot accept views, beliefs, or behavior that differ from their own. Tolerance does not mean that you have to follow their beliefs or opinions; it is only the acceptance of the fact that like you they also have the right to have their own opinions or beliefs. You do not have to agree with them but just accept that they have a right to do what they want, even if is different than what you want. Consider an example: You go to a restaurant and order pizza, however, it does not mean that your friend should also love pizza or should have pizza, instead he or she may want a burger, which is their right to have even if you hate burgers. Medically, the term tolerance means to be able to accept and endure the presence of a drug or a substance that may or may not cause harm to another. 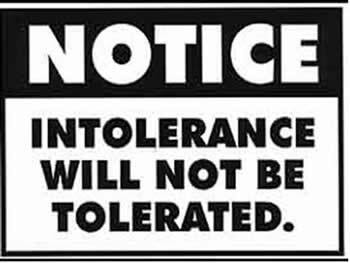 Similarly, intolerance means to not be able to endure the presence or effects of the drug or substance. In fact, intolerance often indicates adverse effects to that substance. For example, some people are intolerant to lactose, i.e. a substance present in milk and other dairy products. They face some adverse effects after consuming dairy; however many other people are tolerant to lactose, i.e. they don’t face any effects from it. Islam often faces tolerance from most people of other religions. Most people build a tolerance to certain drugs over time. However, some do face intolerance from radical groups. Many children are affected by gluten intolerance.